glotherapeutics offers a variety of chirally correct, potent products to target your every skin concern. 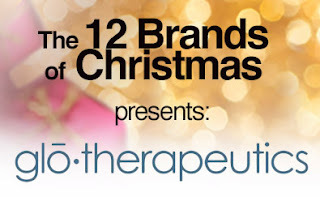 It's become an office favorite and I have to admit, I'm super excited about this week's 12 Brands of Christmas grand prize. 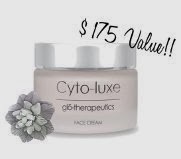 I've tried and loved many different glotherapeutics products, but today I want to let you in on my ultimate beauty secret – glotherapeutics Cyto-luxe. When you hear Cyto-luxe, think pure luxury, pampering and spa-like treatments. With cutting edge, pharmaceutical-grade ingredients, Cyto-Luxe is the solution to achieve ageless skin. First in my daily regimen is the Cyto-luxe Cleanser. With my dry skin, I usually go with creamy cleansers, but I hate when it feels like it just sits on my skin. This cleanser starts out ultra-creamy then builds into a rich lather. I’ve used it both with and without my Clarisonic and loved both results. It’s got a great, refreshing scent, and a little really goes a long way. When I first tried a small sample, I got three uses out of it, so I know the full size product will last me quite a while. At night, I use the Cyto-luxe Face Cream after cleansing. I am always trying different moisturizers to see what provides long lasting results. WOW! This is seriously the silkiest, richest cream I have ever tried! It’s one of those products that I really look forward to using every night and I know my skin will really love it in the winter time. We were all lucky enough to get to try the new Cyto-luxe Body Lotion and we can’t stop raving about it! First off, even the bottle looks luxurious, and in this case, you can tell a product by its packaging. With a barely there fragrance, this super-rich lotion with Shea Butter and Hyaluronic Acid absorbs quickly. Because it’s Cyto-luxe, you’ll also see anti-aging benefits. Clinical studies showed skin firming within two hours of application and reduced wrinkles after 28 days of applying twice daily. It’s definitely on our must-have list! 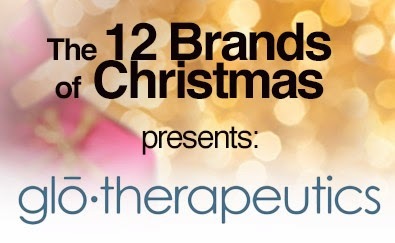 Trying these amazing products really has me interested in the entire Cyto-luxe Collection. The Cyto-luxe Mask contains Pearl and Caviar Extracts, and even fermented Platinum – you can’t get more luxurious than that! Cyto-Luxe Serum contains SYN-AKE, a tripeptide that mimics a peptide found in snake venom that constrains muscle contractions, giving skin an anti-wrinkle effect…wow! After falling in love with Cyto-luxe Face Cream, I’m sure the Eye Cream is just as dreamy. For an even greater moisturizing effect, it is recommended to add a drop of Cyto-luxe Face Essence to the Face Cream. This treatment helps your skin fight off environmental toxins, nourishing skin while controlling oil so I can’t wait to try it! Now that I've let you in my secret, here's your chance to win!! Wanna win? Visit our Facebook Giveaway Page to see how you can receive entries!! Until next time…. stay tuned and stay beautiful! !